The 2013 meeting of Aniridia Foundation International (AFI) was held in Charlottesville Virginia, USA, at the beginning of August. Many of you may be beginning to take for granted the format of these meetings with patients and their families participating along with clinicians and research scientists, but I still find these gatherings very exciting and refreshing. There is so much scope to learn from each other. For Ruth Ashery-Padan, a scientist from Tel-Aviv, Israel, this was her first experience of such a meeting and she thought it was wonderful for her own insights into how aniridia affects people and how they deal with the problems that arise. A meeting like this sets out to look at the problems from many different viewpoints and explore all the ways that patients and parents as well as different clinicians and scientists can devise to overcome the problems. Most of the scientists like me were asked to arrive only for Day 3 of the meeting but I’ll cover the previous days here too..
Day 1 focussed on talks from educational experts. They explored everything from early childhood, primary and secondary schooling and the transition to college education. There were sessions ranging from how to deal with bullying to how to plan employment and careers. On Day 2 it was interesting to see that AFI has been expanding the contexts in which aniridia is studied. In fact they have set out to study the condition in much broader detail. They have realised from their collective experience that the PAX6 mutation does not merely cause eye problems but may in some individuals also have effects on circadian rhythm (eg sleep disturbance) and on metabolism, possibly leading to weight problems and diabetes. There may also be effects on brain development affecting other sensory systems (eg hearing). Their aim is to study many of these possible features for what they have begun to call aniridia syndrome. Next on Day 2 there were introductions to the scientific and clinical backgrounds related to these possible aniridia-associated problems. I wish I had been there to hear these talks, but many aspects were reiterated on the following days when I was there, so I can tell you about those sessions. With a complex topic like this, it is a good idea to tell the stories more than once, with different slants emphasized each time. From mid-afternoon till dinner, there was a big clinic session to collect patient information on visual and other measurements. The aim is to learn more about the broad and variable spectrum of the aniridia effects by relating the genetic and hormone information to the clinical features of participating patients. On the morning of Day 3, there were six talks for patients, mostly from clinicians, explaining some of the available therapies for cataract, keratopathies and retinal problems. The first talk was from Peter Netland who is the ophthalmology chief associated with AFI and based at the University of Virginia Medical School and hospital system. He outlined the ambition of AFI to expand its remit from just aniridia to congenital eye disorders more generally because they feel this would increase their influence and broaden their patient base. Juan Alveraz de Toledo from Barcelona discussed current approaches to treating cataracts and dealing with keratopathy. John Freeman from Memphis Tennessee discussed the use of the artificial cornea, the Boston Kpro (=keratoprosthesis) in very severe cases of aniridia-associated corneal disease. Kristiana Neff from South Carolina described how artificial iris implants can be useful in some cases. Christopher Riemann from the world-renowned Cincinnati Eye Institute illustrated with amazing film records some of the heroic endoscope-based operations he undertakes to save as much vision as possible in very severe aniridia cases with retinal fibrosis. 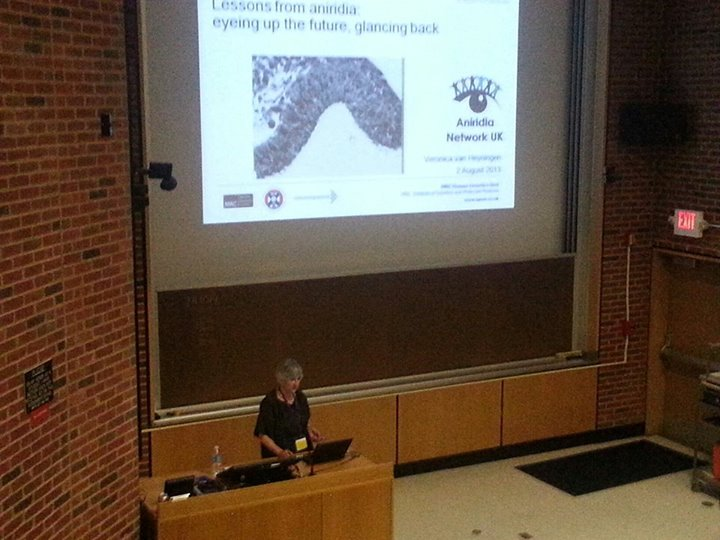 Scientist Melinda Duncan, from Delaware, also discussed her work to understand this aniridia fibrosis syndrome better using mouse models. The afternoon of Day3 was devoted to scientific talks which were meant to be informative for all participants: patients, clinicians and other scientists. This is always a tall order. The afternoon began with a lunch-time talk in which I was invited to review the many years of my lab’s work on aniridia – partly because of my recent retirement. Then we had more talks. Robert Grainger, the local organiser and an eminent scientist who made major contributions to our understanding of lens and eye development, using the frog as his model system. With the advent of new genetic methods, he can now create mutations in the frog to mimic human eye abnormalities and then study them in more detail. This adds to our repertoire of different model systems – my lab used mice and more recently zebrafish. Different model systems are useful in different studies so it is exciting to have several different organisms to study. Robert Chow from Victoria, Canada then presented his work in progress on novel levels of PAX6 regulation by micro-RNA molecules. This could have long-term importance since most cases of aniridia are caused by having the wrong dosage of PAX6, so there could be therapies developed by modulating mechanisms regulating gene expression. Ruth Ashery-Padan from Tel-Aviv talked next. Ruth has worked on the developmental roles of PAX6, using mice, for many years. She is a pioneer of a technique in which the mouse PAX6 gene, which is very very similar to human, is manipulated so that it can be turned off subsequently in different cell types. So she has managed to turn off Pax6 in the developing retina, separately from the switch off in lens, or pancreas, or in very specific parts of the brain. This is one very clever approach to dissecting the complex functions of this gene. Ruth talked about the many different roles of PAX6 in the developing eye, which help to explain why so many different aspects of the eye have problems when one copy of PAX6 is not functioning correctly. William Klein from the University of Texas, Houston then talked about other eye regulatory genes with key roles in retinal development. As PAX6 is part of gene network with complex cross-regulations with other genes, it is important to understand how other eye regulators work in conjunction with each other. James Lauderdale, Athens University of Georgia, gave an update on the PAX6 mutation studies that his group have carried out, interacting very closely with AFI members and Peter Netland. Jim is supported extensively by the Sharon Stewart Trust originating in Canada. Interestingly they have found loss of function mutations in almost all cases where a PAX6 mutation could be identified. They have completed their studies in 68 families and found 51 PAX6 mutations. Only 3 were found to lead to predicted longer PAX6 protein with the rest predicted to result in no protein being produced from the mutant copy of the gene. This is exactly what we find for classical aniridia cases. Jim’s group are also carrying out extensive wider “phenotype” studies in the AFI volunteer cohort – more about this later. Next Elizabeth Simpson, from Vancouver, Canada, discussed her group’s efforts, again supported by the Sharon Stewart Trust, to develop gene therapy for aniridia patients. They have been designing “DNA vectors” that can deliver the gene to the eye, initially to all cell types, but planning to refine expression only to various PAX6 expressing cell types. All this work is done in mice at this stage. Results are very preliminary. Therapy needs to be delivered to very early post-natal eyes to have a therapeutic effect on eye size, for example. There is a very long way to go before this type of therapy becomes available for human trial. They hope to reduce the lead time by producing a monkey model of aniridia by creating specific PAX6 loss-of-function mutations in Rhesus macaque monkeys in collaboration with a major primate centre in the US. Cheryl Gregory-Evans, also from Vancouver, discussed the development of the fovea which is the sensitive central part of the retina. Foveal hypoplasia (under-development) is a key feature of the aniridia which means that the final achievable visual performance in aniridia patients is always less than normal. We know surprisingly little about the development of this region of the retina and the usual model organisms are not useful as they do not have foveas. It would obviously also be useful to have a monkey model to study for this work. This conference was pretty intensive and hard working as emphasized by having a plenary lecture after dinner on Day 3. Tom Glaser, who was one of the early workers on PAX6 and aniridia, talked about other hereditary eye malformations caused by defects in the retinoid, including Vitamin A pathways. It has been recognised for a long time that adequate levels of Vitamin A are critically required for proper eye development. It is not surprising therefore that mutations in proteins required for managing retinoid synthesis and turnover cause eye malformations. On the morning of Day 4, Many of the clinicians who spoke predominantly to the patients on the previous morning, now re-presented their work, sometimes with a different slant, to the scientists. This would have been a useful revision session for the patients – a second chance to assimilate the complex details of surgical procedures and when they were most appropriate to use. The lunchtime presentation on this day was from Jim Lauderdale and his team who described the complex laboratory and clinical studies that they had been conducting on AFI recruits to define their non-ophthalmic phenotype more clearly. We heard that as predicted from mouse models, aniridia patients have somewhat elevated levels of glucose in their blood after meals than matched control cases. This means that aniridia patients may have a greater predisposition to developing diabetes than normal controls. Thus more detailed studies of the pancreatic and pituitary hormone systems will be explored in more detail. The next presentation told us about the brain imaging and functional studies that they carried out on the volunteer patients and controls. This followed on from the earlier papers that my colleague Sanjay Sisodiya had published with us about abnormal brain structure in aniridia cases. Now the Lauderdale team described their preliminary results from electroencephalography studies in 15 aniridics and 15 controls. Small differences were observed in these brain functional studies, so that for example there seemed to be a slight delay in event-related potentials – the brain responses to stimulatory signals. They are also planning functional MRI analysis and auditory signalling studies, which are potentially interesting and informative about understanding in minute detail the potential neurological differences between those with aniridia and control subjects. After lunch on this final day, we heard from Cheryl and Kevin Gregory-Evans, Vancouver, about the development of a novel type of therapy using a particular type of antibiotic which can prevent premature stop codon mutations from terminating the protein too soon. The drug causes the insertion of another aminoacid, more or less randomly (ie any aminoacid) at the stop site. This can help increase the amount of protein made from the mutant gene copy. Only a few patients carry the right sort of mutation for this to work, but it is an interesting approach. The preliminary studies were carried out in mice and this scientist/ophthalmologist couple are ready to try the therapy in human patients with appropriate PAX6 mutations. It is an approach that has being tried with some other premature stop codon mutations with other diseases, including cystic fibrosis. For the rest of the afternoon we had talks about the possible role of PAX6 in obesity and diabetes. For example Ruth Ashery-Padan discussed how PAX6 is required for correct pancreas development. The numbers of normal pancreatic alpha, beta and delta cells producing insulin, glucagon and somatostatin seem to be decreased in Smalleye mice but there is an increase in ghrelin levels leading to increased desire for food intake. The following two speakers were world famous local University of Virginia experts: Michael Thorner in the study of ghrelin and other endocrine regulators of obesity and Michael Menaker who over the past 50 years of research discovered the circadian pacemakers in mammals and other organisms. Mammals have the major control machinery for resetting their daily clock in special retinal photoreceptors distinct from those used for visual function. Circadian rhythms are critical in maintaining appetite control. Clearly it is possible that some of these mechanisms may be perturbed in aniridia and other eye anomaly patients. The role of light control and meal timing in regulation of total food intake and weight control were then discussed by Satchidananda Panda from the Salk Institute in a fascinating talk. These talks were great, but did not study circadian functions or food intake in aniridia patients. However, Joan Han, a paediatric endocrinology expert from the National Institutes of Health, Bethesda who gave the last talk, described some of her ongoing studies on hormones and metabolism in WAGR patients who have also been suggested to have a predisposition to obesity. All of this evidence is fascinating, but very circumstantial at the moment about whether having aniridia does lead to a propensity for obesity through disturbed endocrine and circadian control. Some of the direct studies with AFI volunteers that are just beginning with the blood samples and clinical details collected at the University of Virginia meeting may shed more light on this. The meeting ended with a gala dinner where a number of prizes were presented by the very generous AFI President Jill Nerby. Peter Netland, Christopher Riemann, Jim Lauderdale and Rob Grainger were among the recipients of these prizes for their fantastic contributions to clinical and research efforts. 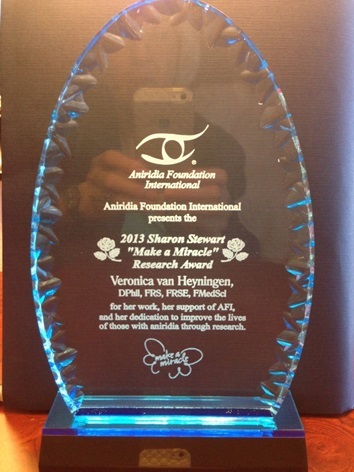 They also most kindly presented me with an award for my long standing contributions to aniridia research. It was a most interesting meeting. AFI are set to explore aniridia in more detail than ever before and to place it into a wider context of congenital eye disease research. We may want to discuss at ANUK, although I am not advocating this sort of expansion for the UK organisation since our situation, with a much more organised National Health Service in a smaller country, is very different from that in the US. However, it is very clear, even just from the work in my lab, that there are biological and gene-based links between aniridia and some other eye disorders. We can discuss the implications of and what ANUK members wish to see happening here and in Europe. This entry was posted in Medical staff talking, Research and tagged AFI, iol, keratoplasty, NIH, sleep. Bookmark the permalink.